Thorazoo was formed in 2003. The band’s music is a result of years of music written by Nigel Harrington. Thorazoo are a three piece band consisting of Nigel Harrington ( lead vocals, piano, trumpet, mandolin, acoustic guitar ), Steve Reese on guitar and Javier Roderigo on congas and percussion. Nigel had been doing solo shows for three years when he met Steely Hank ( from Amsterdam ) and his Dutch guitarist friend Hanzy Aartz in Bellingen, NSW. Steely Hank and Hanzy had moved to Thora Valley ( west of Bellingen ) from Amsterdam and decided to work with Nigel incorporating guitars with his music. Considering Nigel also moved to Thora from St. Kilda, the boys decided to call the band Thorazoo. Unfortunately, Hanzy had to return to Holland in 2005 after working with Nigel and Hank on 4 demo albums of Nigel’s music ; enter new band member Javier Roderigo ( congas and percussion ) , born in Uruguay. 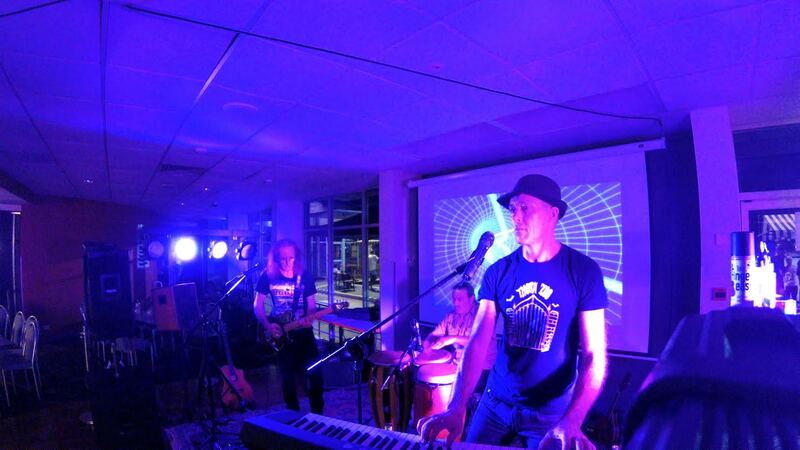 The band started working on a vast cover repertoire ( all backing tracks created by Nigel Harrington ) for the next three years and fuse familiar rock classics with their original dance music so that the audience can get their groove on the dance floor. Thorazoo was unearthed by 2JJJ in 2006 and have been playing to wide audiences throughout their musical history. In 2014, Nigel Harrington recorded and produced Thorazoo’s first album titled ‘Awakening’ and released on I-Tunes which is a compilation of Nigel Harrington’s music with Steely Hank on guitar, Javier Roderigo on percussion an Nigel Harrington creating sequences, keyboards, trumpet and vocals. 2014 saw some changes with Steve Reese replacing Steely Hank on guitar. The philosophy of the band is to get the audience dancing. The style of the music is dance electro-funk, experimenting with such rhythms as hip-hop, salsa, house, drum and bass and psy-trance, but with guitars in the mix, the band has broken new ground. The sound is awesome ; THE MUSIC ROCKS !!! THORAZOO WILL FUNK N ROCK YOU !! !